A day trip through Accra, Ghana. In today’s world of increased remote working and shrinking global footprint, sometimes it’s something as unromantic as work or a long layover that takes us to a new city rather than an extensively planned vacation. 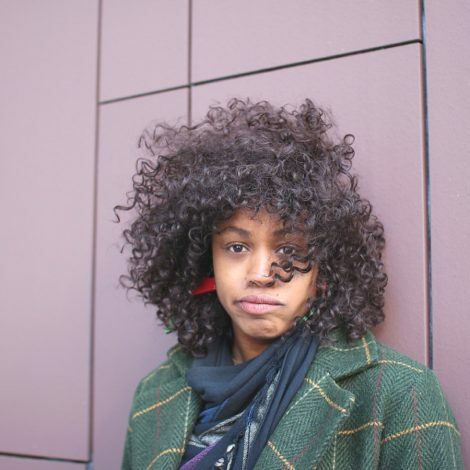 But that doesn’t mean we still can’t make the most of whatever time we find in a new city. Who doesn’t love getting to check out new cities in countries across the world? Raised in four countries on three continents, I’ve been able to travel somewhat extensively most of my life, even going as far as Australia, which honestly feels like the end of the world if you don’t live in Asia. The more airplane rides I took across oceans, I began to notice how much I appreciated the little city guides I found in-flight magazines. I would pull out my iPhone and jot names of the listed “must-see” cafes and boutiques in European cities. 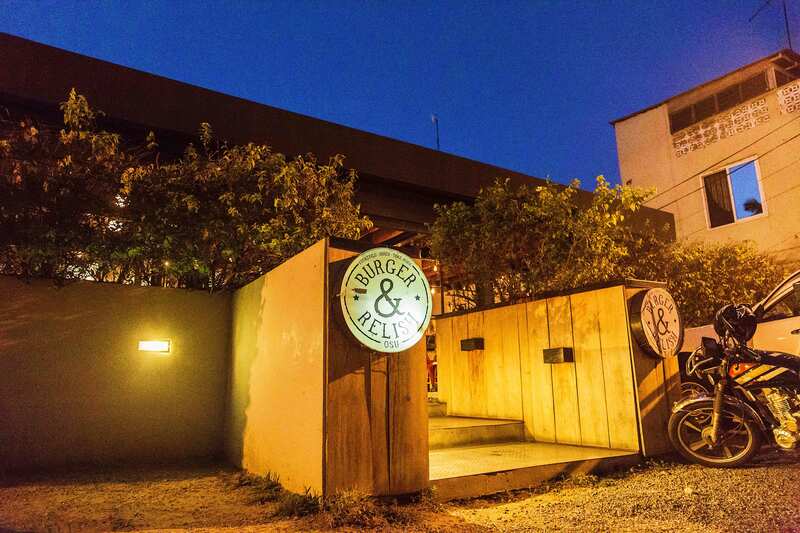 But the more I traveled the more I realized how rare it was to find these little urban snippets for African cities as if the only thing African countries had to offer were visits to tribal villages, rustic game park lodgings or sobering pilgrimages to historical sites. 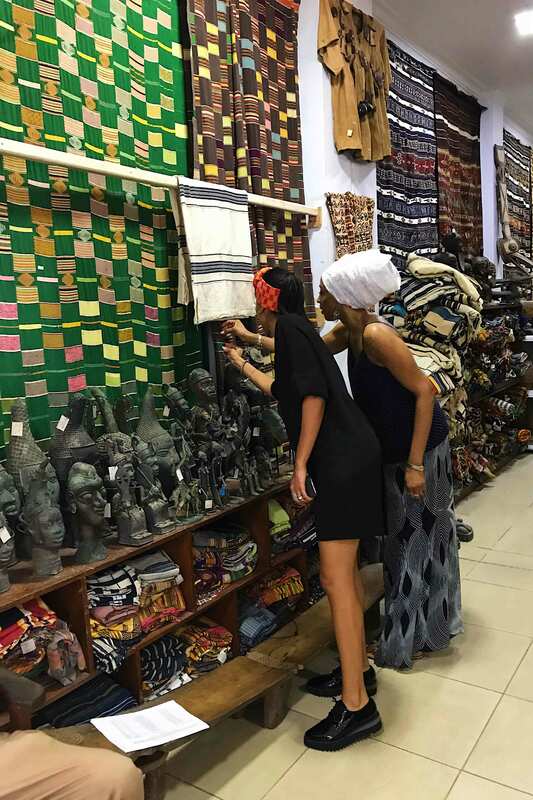 Instead of “5 Can’t-Miss Boutiques in the Bustling City of Lagos” or “3 Great Spots for Breakfast in Abidjan,” I would find titles like“10 Safety Tips for Visiting Africa” or “3 Sure-Fire Ways to Avoid Malaria While in Africa.” I wanted and needed something different both in content and practicality. 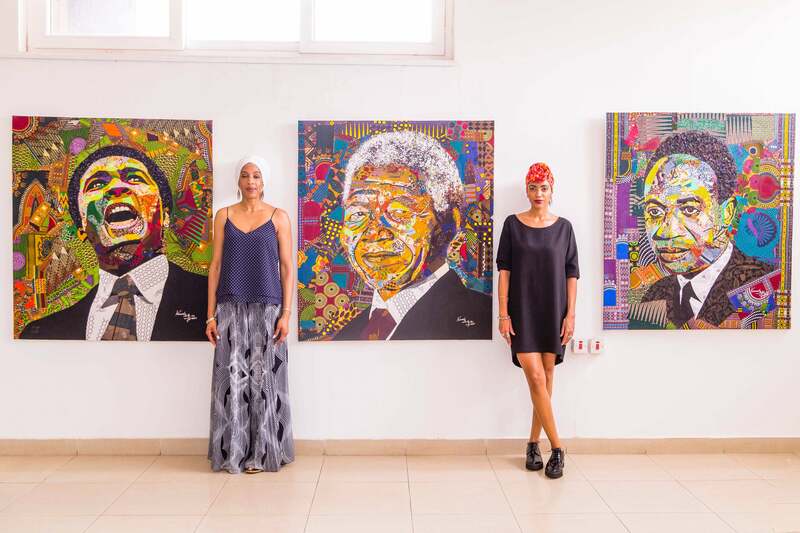 Having relocated to Nigeria from New York, my own work often takes me to different countries on the African continent. I’ve often craved a guide for 12 -36 hours in different African cities. 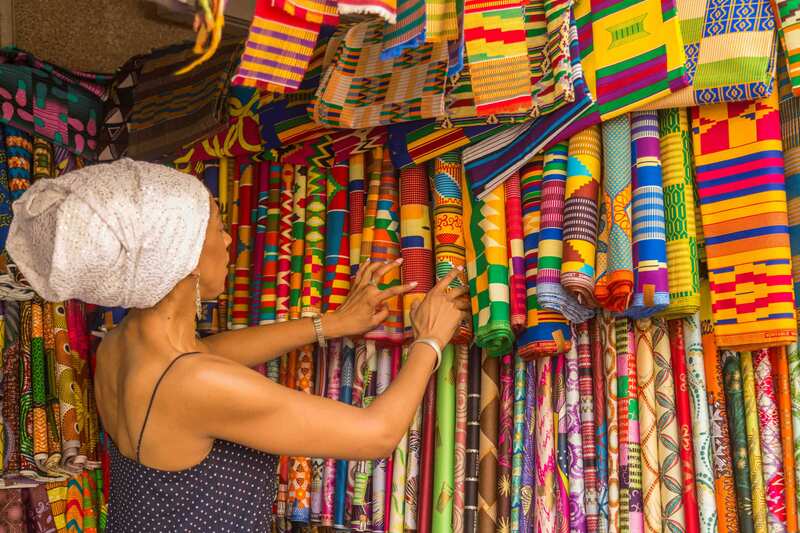 So, on a recent trip to Accra, Ghana for an African media conference I decided I’d enlist the company of a Ghanaian girlfriend, take my free 12 hours to explore the city and make my own guide. Now let me first give this caveat, Ghana is typically not a country to rush through. 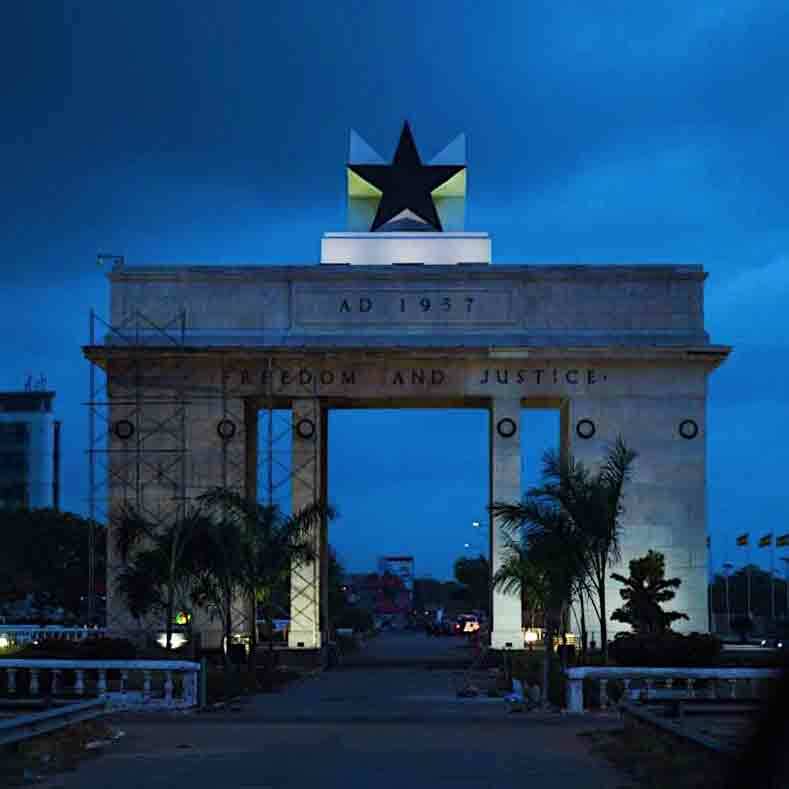 As the first African nation to gain independence from colonial hands under the leadership of renowned pan-Africanist and first president, Kwame Nkrumah, it has a fascinating history replete with places to elicit both deep sorrow and rich pride. Home to the UNESCO Heritage sites like the colonial slaveholding castles of Cape Coast and Elmina, Ghana is also home to beautiful beaches, national parks and the ancient Ashanti Kingdom. But if you’re ever in the capital, Accra, and don’t have the time to make the 2.5-hour drive to Cape Coast to see the Door of No Return or make the 5-hour drive to Kumasi, heart of the ancient pre-colonial Ashanti Kingdom, don’t despair. Here’s something for you. 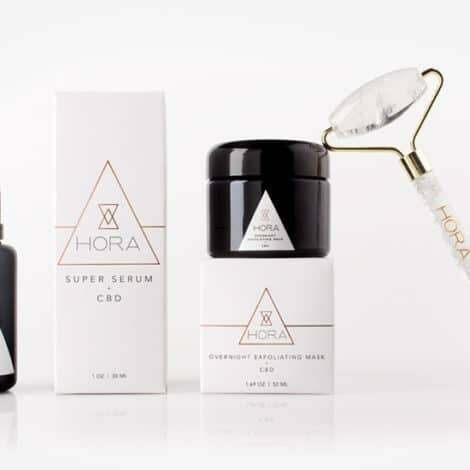 8pm: I arrived at night and checked into my accommodations at the Olma Colonial Suites, an 11-room boutique apartment and hotel conveniently located in the Osu area, which is about 15- 20 minutes from the airport. It was after 8pm and I was exhausted but I was immediately enchanted by the grounds. Navigating the small but winding entrance into the courtyard was like sauntering through an intricately crafted oasis complete with overhanging bougainvillea blooming with little bursts of fuchsia flowers and a cozily-lit swimming pool. When Ben, the receptionist, showed me inside my little guest apartment I knew I’d have a hard time leaving the next day. It was so cozy and warm. 9am: Wake up in an unbelievably comfortable bed at Olma Colonial Suites, the cutest boutique hotel I could find and have someone bring me espresso coffee. Check! As I suspected, I didn't want to leave my newfound home! I imagined tiptoeing across the wooden floors to the living room and spending the day curled up with my kindle on the couch. Oh so tempting! But I was on a mission to spend an amazing 12 hours in Accra. 10am: Breakfast is my favorite meal of the day so I was picky in my research. I decided on Café Kwae. 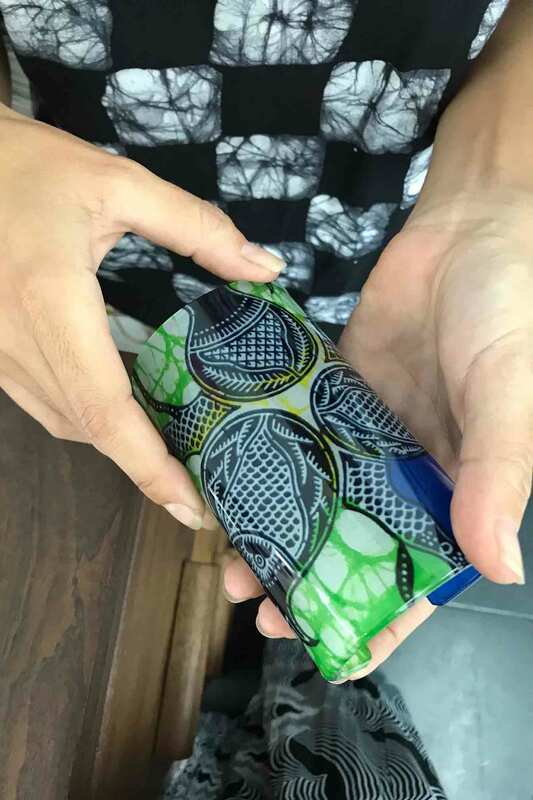 Owned by Yvette Ansah and named after her grandmother Kwae, the Ghanaian name literally means forest but Yvette told us it symbolizes wealth and abundance. 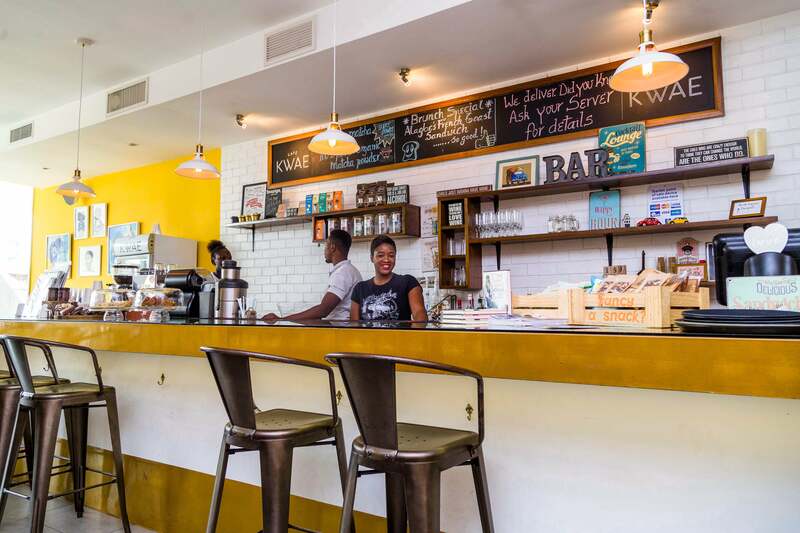 I found everything I was looking for and more on the menu and loved the brightly colored walls and cheery ambiance. 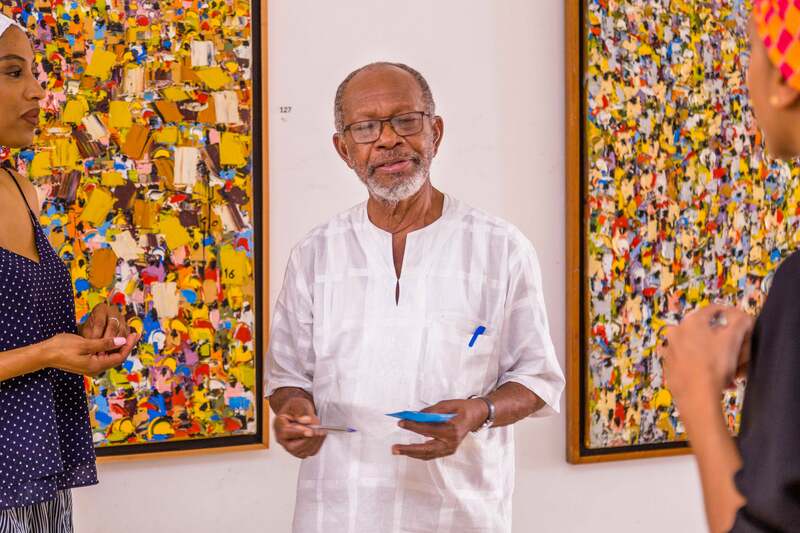 As an art lover I was determined to see some local Ghanaian art and where else to start but the Artist Alliance in Labadi founded by renowned Ghanaian artist and educator Dr. Ablade Glover. 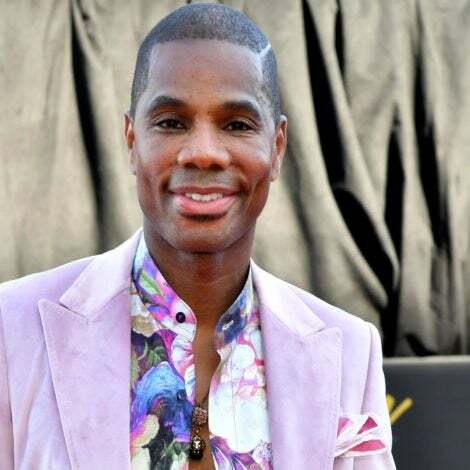 His work has been exhibited in countless countries including Nigeria, Cote D’Ivoire, Zimbabwe, Spain, London and Switzerland. 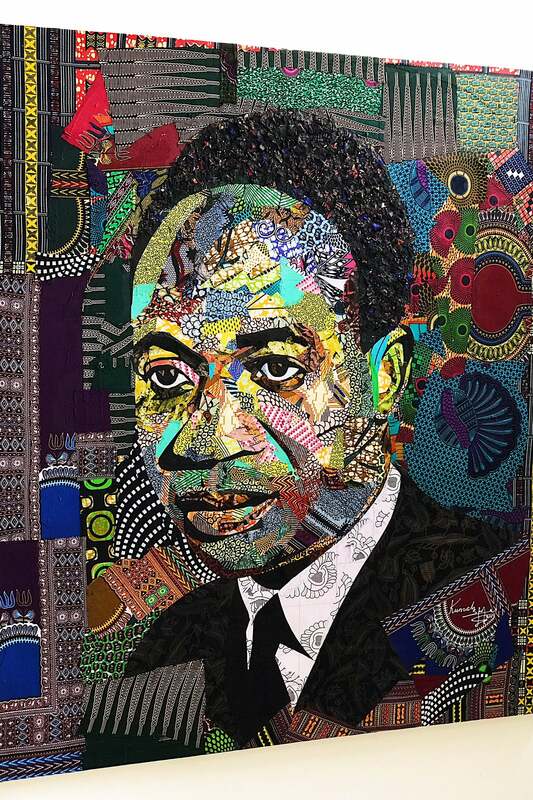 This is a fabric portrait of Ghana's first president, Kwame Nkrumah, by artist Philip Kumah. As seen at the Artist Alliance Gallery in Accra. A fabric portrait of Muhammad Ali by Ghanaian artist Philip Kumah at Artists Alliance Gallery in Accra. 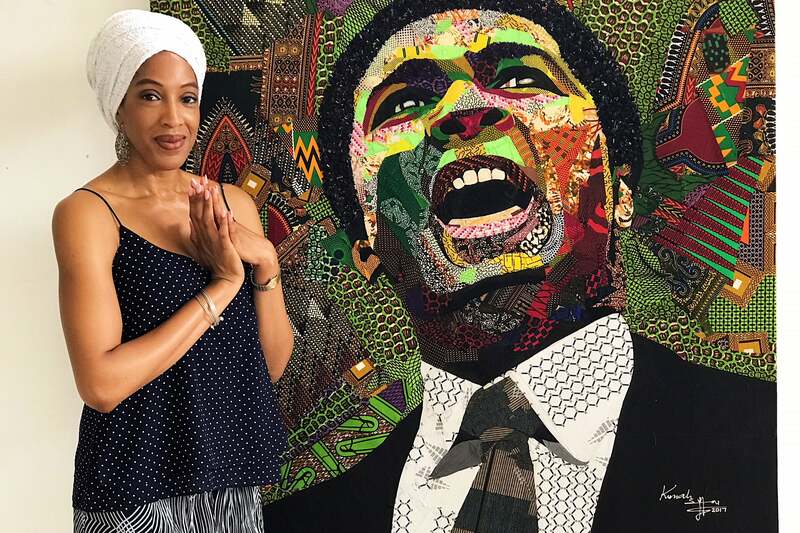 Marie and I had the good fortune of meeting Ghanaian artist and educator Dr. Ablade Glover and got a quick private tour of some of his pieces. Looking through Kente cloths, some as old as 50 years, at Artists Alliance Gallery in Accra. What’s a day in the city without shopping? 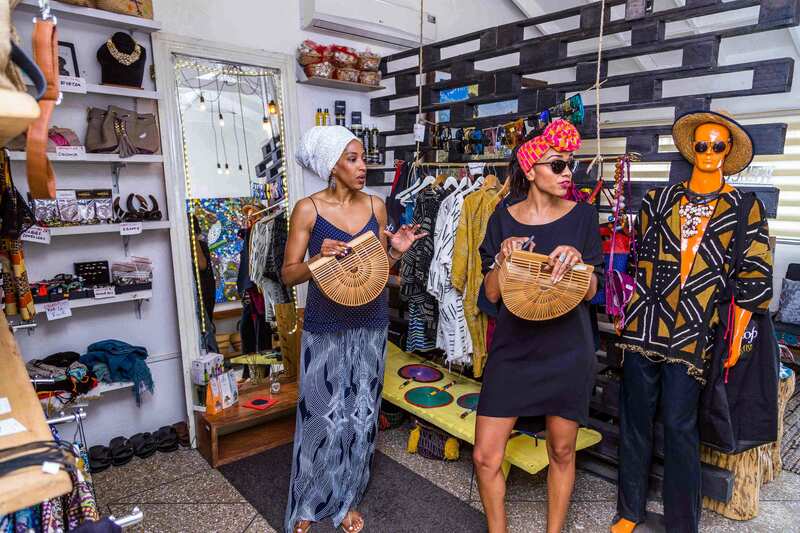 Marie and I headed for a few independently-owned boutiques starting with the adorable Shop Accra owned by Eyesta, a young Ghanaian woman raised in Germany but who returned home to start her business. The Shop was full of locally made clothes and accessories as well as some imported merchandise from as far as Thailand. 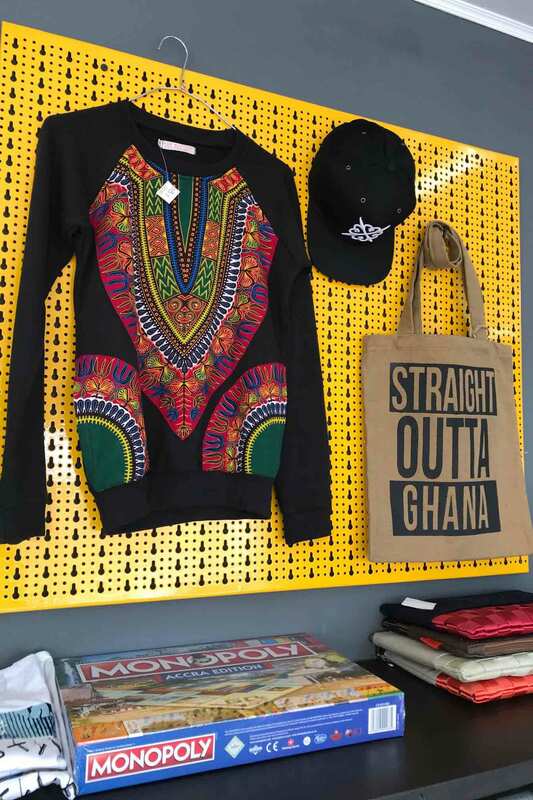 If you're looking for that Instagramable finds, you can find them at The Shop in Accra. 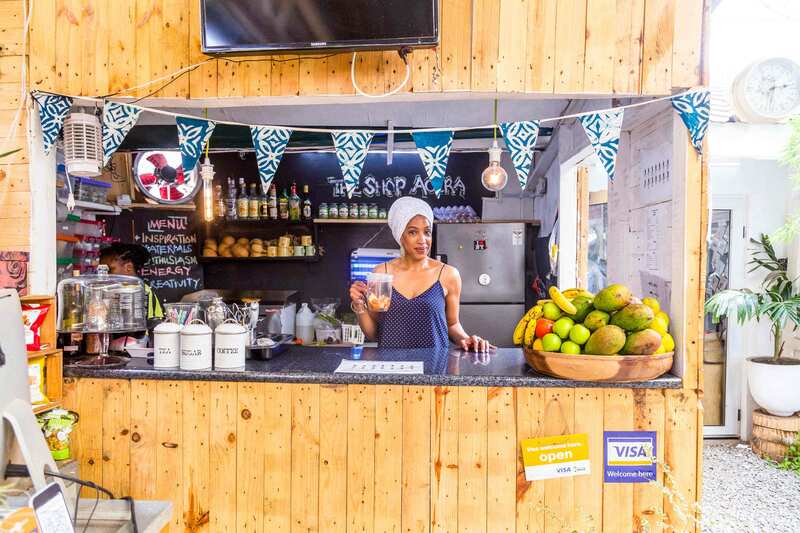 We stopped for mango smoothies at The Shop's backyard tikki bar. 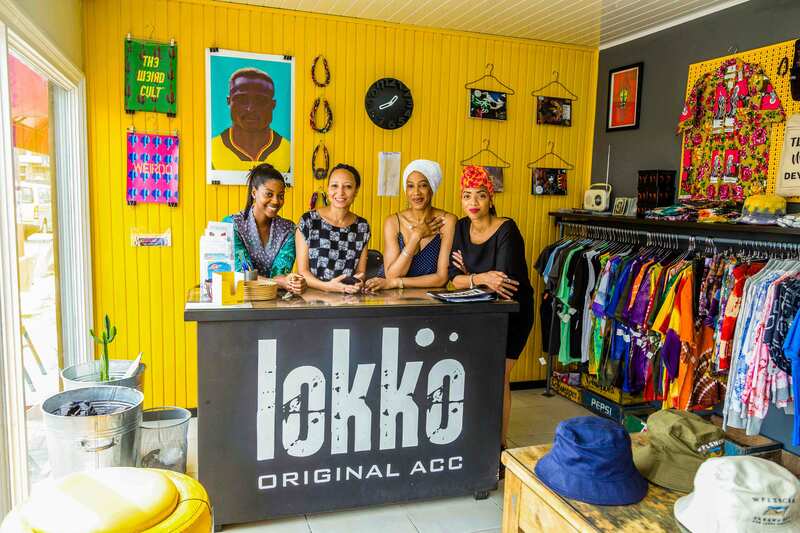 2pm: Next, we were off to the chic and contemporary women’s concept store, Elle Lokko. As soon as I walked in I knew I was in trouble! There were so many cute pieces of jewelry and clothing infused with an African aesthetic of fabrics and prints. While at Elle Lokko, I snuck off with a gorgeous wrist cuff made from a bold piece of cobalt blue Ankara fabric pressed between resin. The added bonus of shopping at Elle Lokko was that I honestly could have spent all afternoon chatting with owner Stefania Manfreda. Is it weird that in the space of buying my hip new cuff I also wanted to ask Stefania if she’d consider the role of newfound bestie in the current film that is my life? 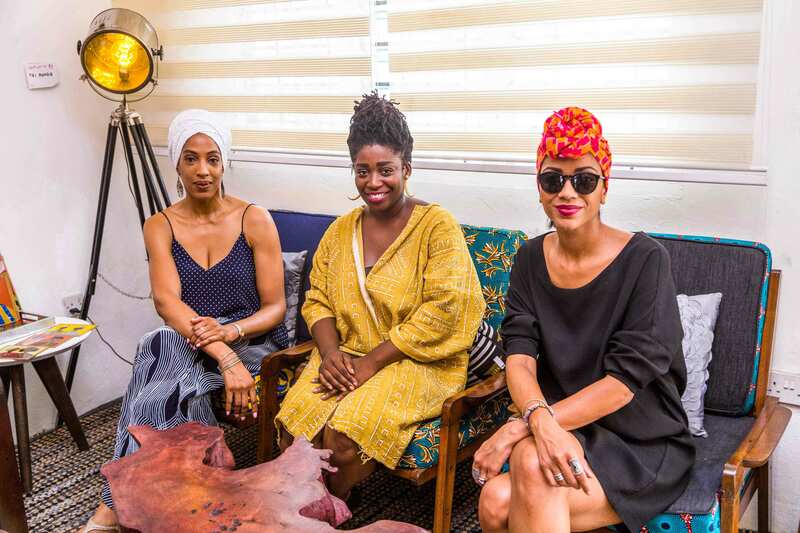 Popular Ghanaian fashion blogger Afua Rida met us at Elle Lokko for some girl time and between the four of us it was an hour of amateur modeling, goofy giggles and a few shameless boomerangs. 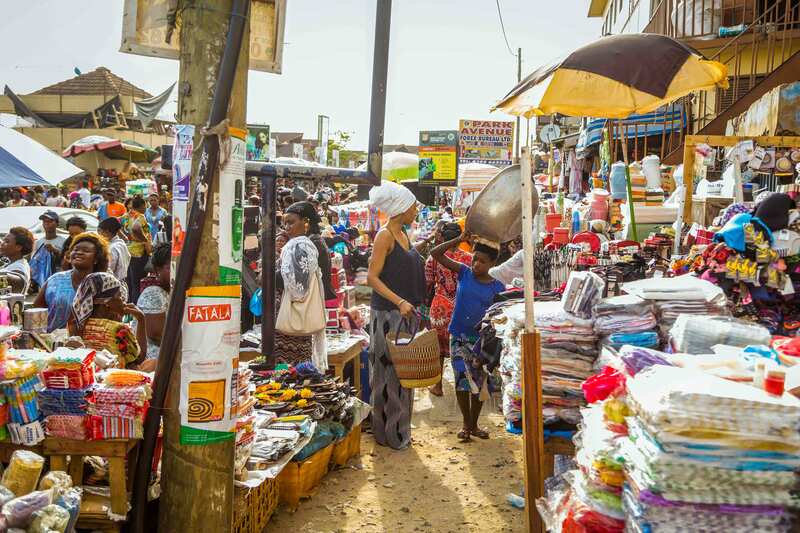 A visit to Accra is not complete without stopping at the famous and busy Makola Market. 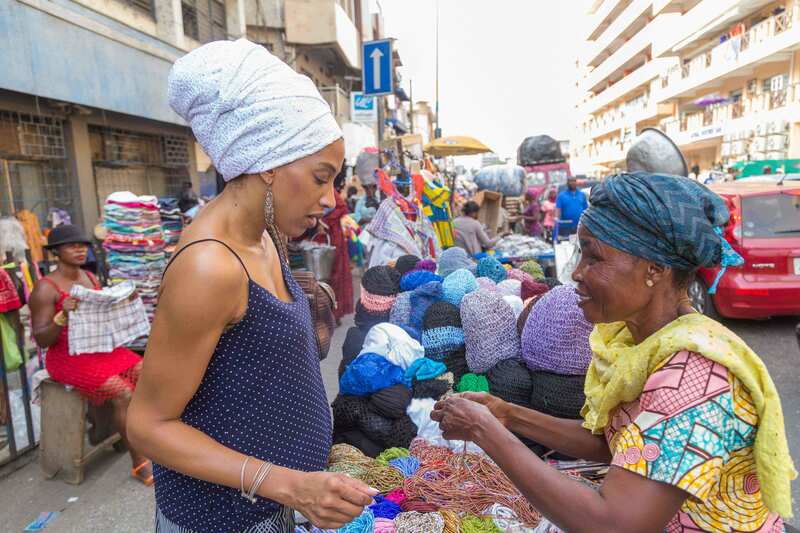 You can find everything at Makola Market, including waist beads. The fabric choices were endless. I also found some gorgeous waist beads. Traditionally women and girls in Africa have worn waist beads for centuries, often used for rites of passage, dance and intimate seduction with partners. 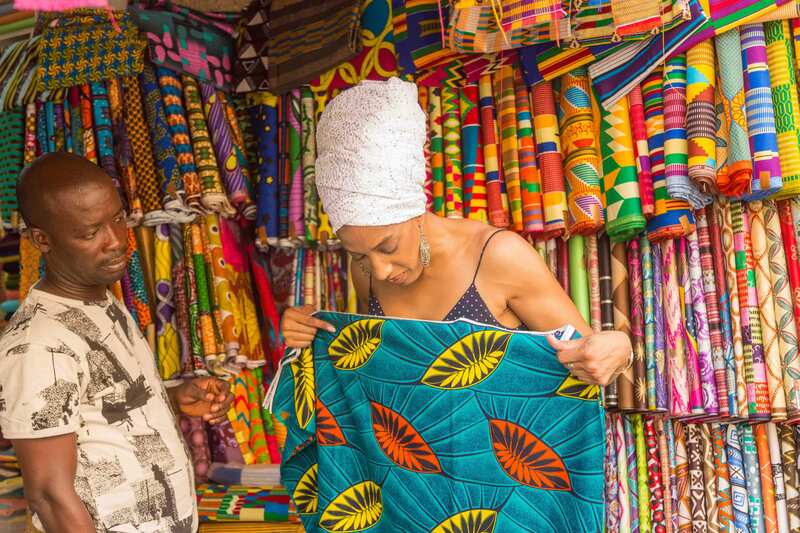 The fabric choices are endless at Makola Market. At 9pm Marie picked me up and we went to The Republic Bar and Grill for a night of live afro infused remixes of old school Anita baker (yes, that’s possible in Accra) and instrumental jazz. 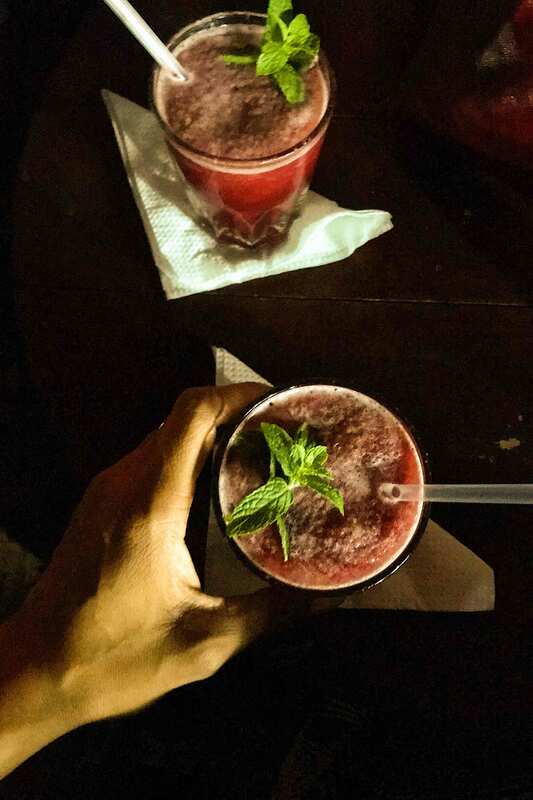 I had been been instructed to try the famous Kokroko cocktail on made with hibiscus and akpeteshi, Ghanaian distilled palm wine. It was delicious and I drank it like an 80’s kid in a sweltering July summer with a pitcher of Kool-aid. 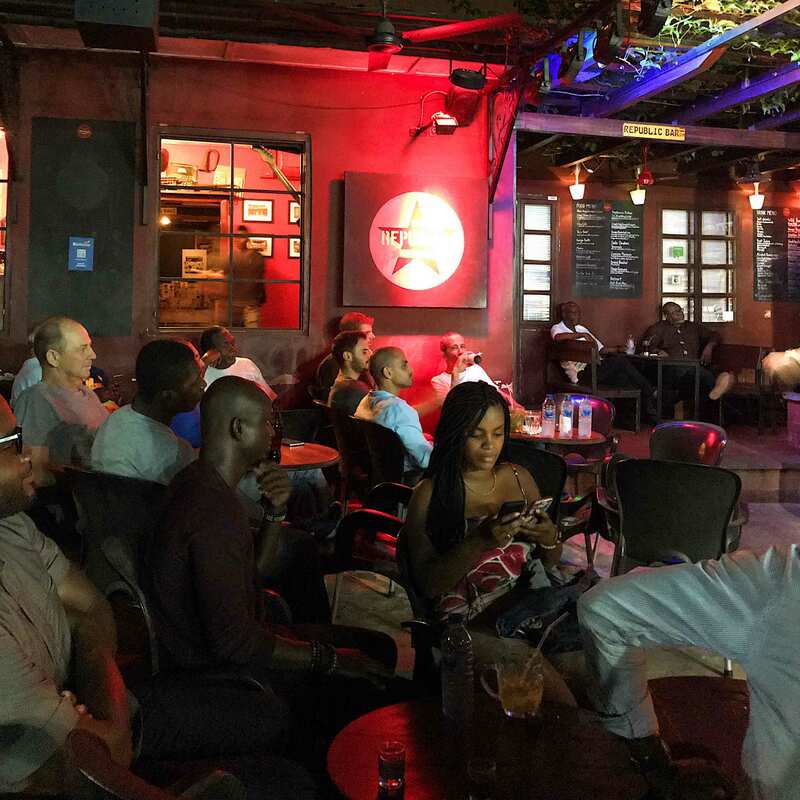 Music, good company and cocktails were a perfect way to close my 12 hours in Accra. I’d take a tour of historic Jamestown, a fishing community that is one of the oldest parts of Accra founded in the 17th century. I’d ride a tro tro, the Ghanaian version of the local public transportation minibus that basically every African city has. 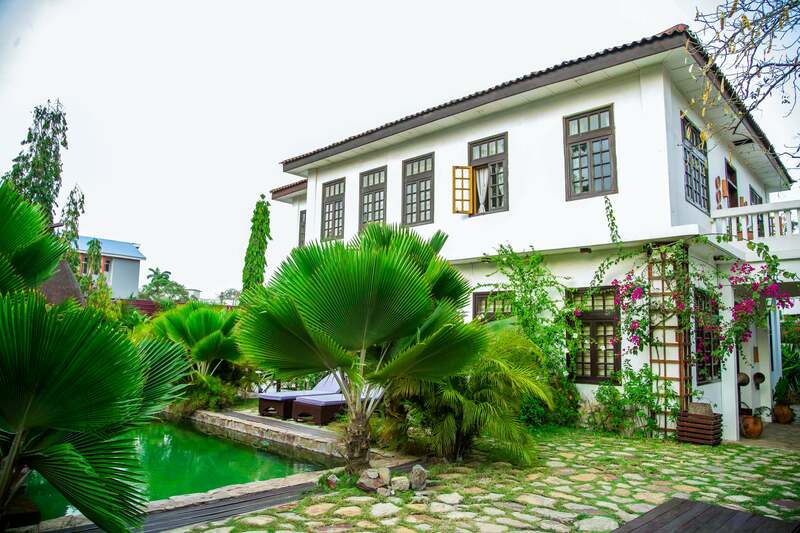 I’d check out the Catonments and Labone neighborhoods for the residential and colonial architecture. 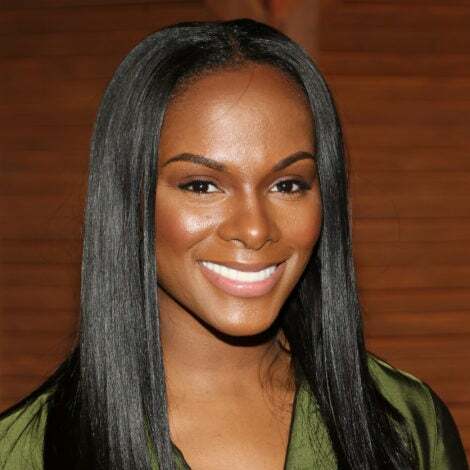 I’d visit more recommend fashion brands and boutiques like Studio 189 created by Abrima Erwiah and Rosario Dawson, Duaba Serwa founded by Nelly Hagan-Aboagye, and Christie Brown founded by Aisha Obuobi. And, of course, I’d spend an afternoon at a local beach worth visiting like Labadi Pleasure Beach or Next Door Beach.